Lighting electrifies any event ‘quite literally’. At Azul Reception Hall we can create a captivating dance floor with our lighting that catches the attention of your guests immediately. Every event is different with different colors and so are our dance floor lights and up lighting – wall lights that blend in with the theme of the event. Irrespective of whether you want an aggressive lighting scheme or looking for a sober one, we can create the magic for you. 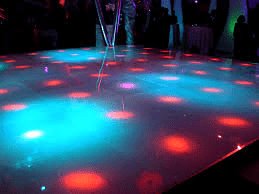 We use state-of-the-art lighting equipment that can be customized to your exact specifications. Share your idea with us and we will create and share the magic!